Today's Inspiration: David Stone Martin: "...unusual pictures, vitalized by many strange textures"
Norman Granz has rightly been credited with fomenting David Stone Martin's status as the premier visualizer of the mid-20th century jazz scene in America. 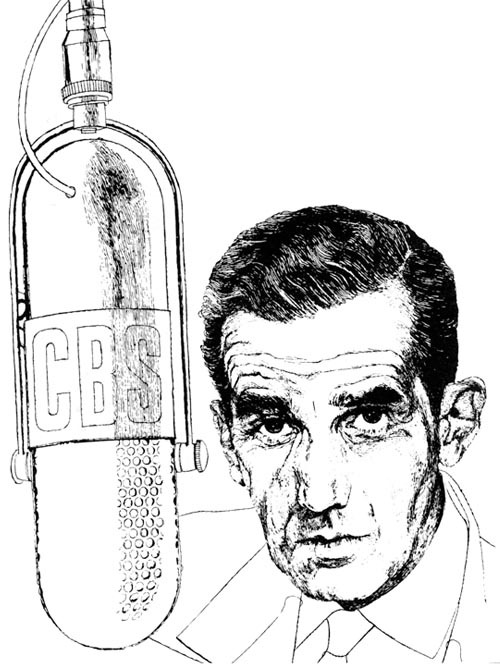 Similarly, William Golden, art director at the CBS Network, should be recognized for nurturing DSM's success in magazine illustration. 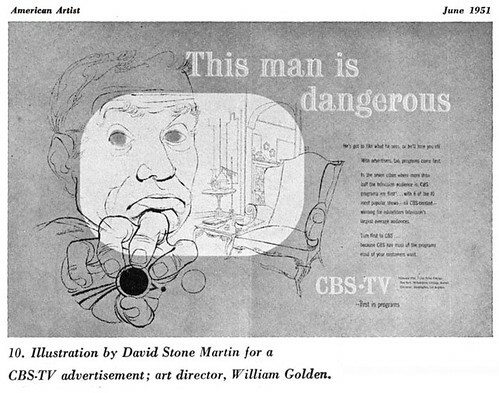 Golden, who worked with DSM in the Office of War Information in the early 40's, was an avid supporter of Martin's post-war freelance career. 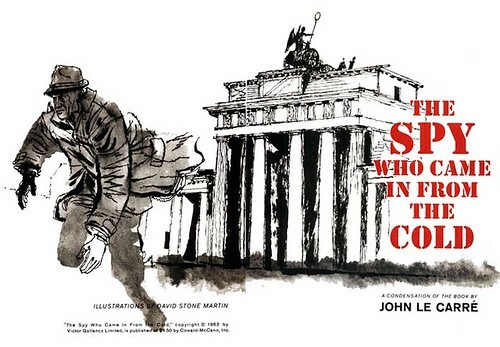 He frequently commissioned artwork from DSM for the CBS Network's expansive, high-profile print campaigns. 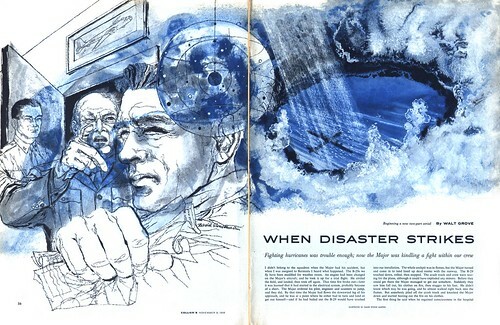 Those ads, which often mimicked the format of a typical double-page spread story layout, went on to win many awards from the New York Art Director's Club -- and likely led some (more daring) magazine art directors to consider DSM for story assignments. Likewise, credit must go to Martin's rep, Lester Rossin, who never passed up an opportunity to use DSM's work on the promotional pieces distributed to clients. In conjunction, David Stone Martin's work secured a consistent presence in a market described by Henry C. Pitz, author of an article on DSM, as mostly "rigid and inflexible". 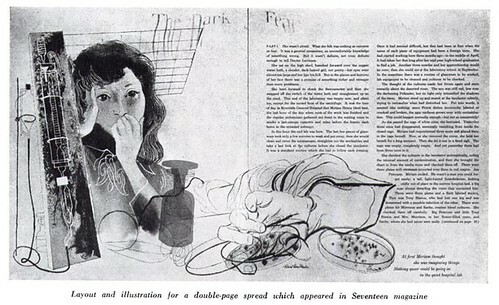 "Smugness and complacency has crept into the make-up of most of our mass magazines," wrote Pitz in April 1950, "built around a great similarity of layout; a too great reliance upon the close-up, with a resulting loss of compositional invention; a parade of stereotyped characters; and an insistence upon a literal and uninspired brand of realism." Pitz writes, "The newness of David Stone Martin's visual impact is not a matter of mere novelty. It goes deeper than that. He seems to have in him a union of forces which is becoming visible in other talents and in other fields. It is a true union, natural and without artificial compulsion, of the old and the new - of modernism and tradition." Again, Pitz nails it: the beauty of David Stone Martin's successful entrée into the mainstream is that he understood how to balance the avante-garde qualities in his work with the classicism the public (and the clients) were comfortable seeing. In doing so, he opened the door for other younger mavericks to walk through in the ensuing years. Remember that artists like Robert Weaver, Phil Hays and Jack Potter arrived on the scene about five years after it became normal to see DSM's work in a broad range of mainstream magazines alongside more typical fair from the Cooper Studio and the Sundblom Circle. Because as Pitz explains, "The large men of the beginning years are gone or are going; they have been replaced by disciples and the disciples of disciples. 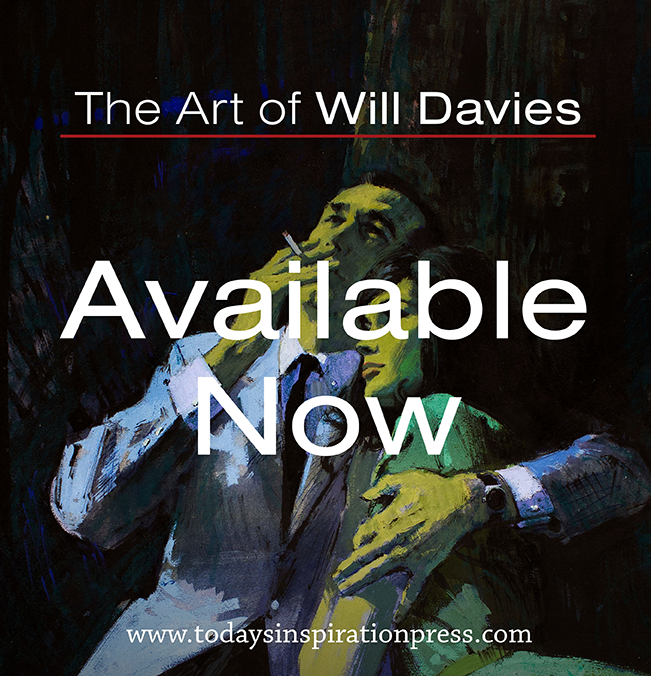 A vision has been contracted into a formula - a small formula that can be readily practiced by thin talents and that is confining as any invented by an academy." But, writes Pitz, "a younger generation of artist is maturing, a generation that has grown up accustomed to the idioms of modernism, that finds no strangeness in it, but dares to question." If that generation had been even more readily embraced, might things have turned out differently? 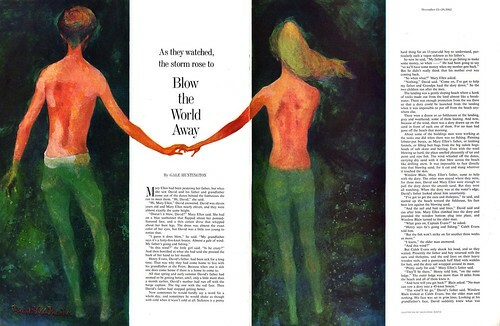 As Walt Reed wrote in The Illustrator in America, "by the mid-sixties the traditional family magazine bases for illustration had shriveled as one after another of the major magazines died. Liberty was the first to go in 1950. Crowell-Collier, with its flagship, Collier's, succumbed in 1956. the mighty Saturday Evening Post was discontinued in 1969. The Post had finally begun granting assignments to David Stone Martin, as in the 1962 example below -- but by then it was too late. And besides, Martin was no longer really creating cutting-edge work. Others were leading the look of illustration... and searching for new markets. Wow, what DSM was capable of is just astounding. 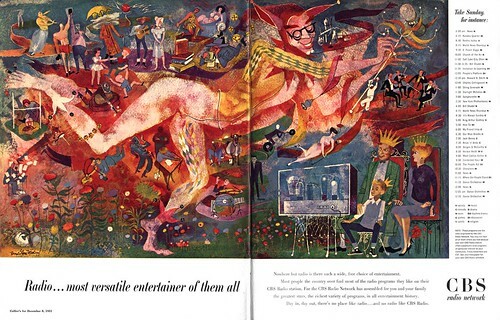 That first image is downright Chagallian; I can't imagine opening up an issue of Collier's back in the 50's and getting hit with that level of out-and-out artistry from a CBS Radio ad. Thanks for the introduction to his work! Thanks Zack - you mirror exactly my own feelings from when I first discovered this work. 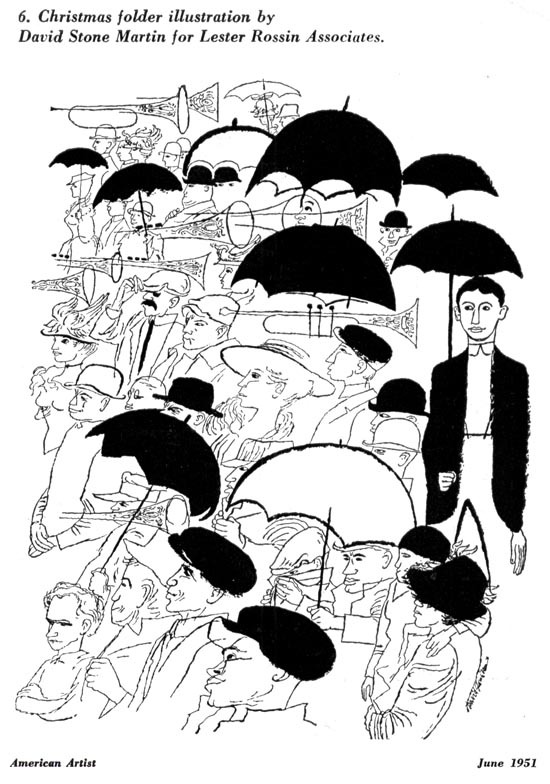 Many people seem a bit dismissive of DSM, saying he owes it all to Ben Shahn... but personally, I give him a lot of credit for crafting so much beautiful work in his own 'voice' - and making it palatable to a broad spectrum audience - no easy task. My young family and I were lucky enuf to live just a few doors away from the Martins, in the late l940's and the 1950's. David was very generous in many ways..at Christmas time he gave many of us a portfolio of prints. We framed and loved many of them for many years. And we shared Hootenanies in his studio quite often. There was a lot of guitar and banjo pickin'. 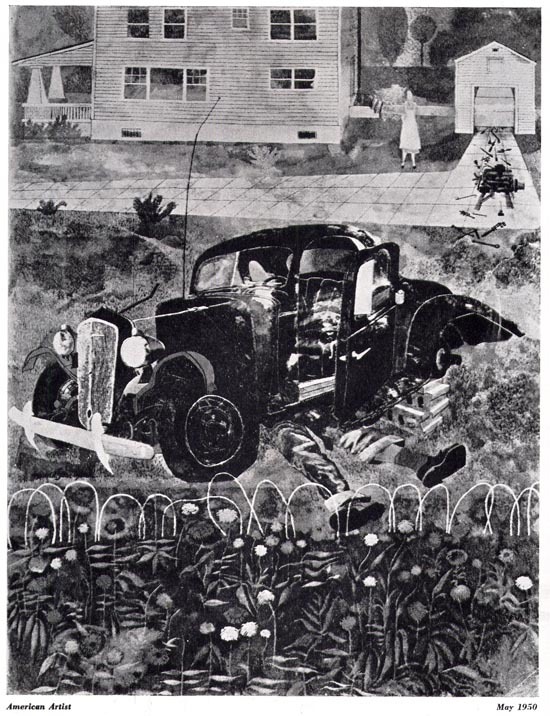 He was a great neighbor as well as an artist. I've searched everywhere for either original or another print of DSM's WWII color drawing I call "Red Cap" b/c it features a train redcap centered among variety of sailors and other persons circa 1940's in train station. Any leads?